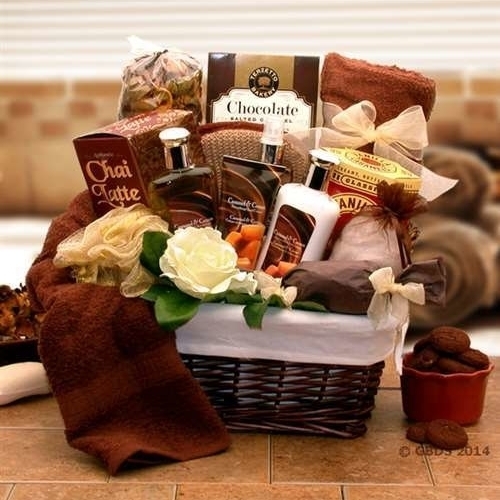 The caramel indulgence spa basket is a gift that surrounds the body in an intoxicating essence that\'s exotic, delicate and thoroughly romantic. Creamy caramel and soothing cream infuse an invigorating shower gel, luxurious body lotion, hydrating hand cream and other gifts included in this comforting spa collection. These are full size 8 oz. 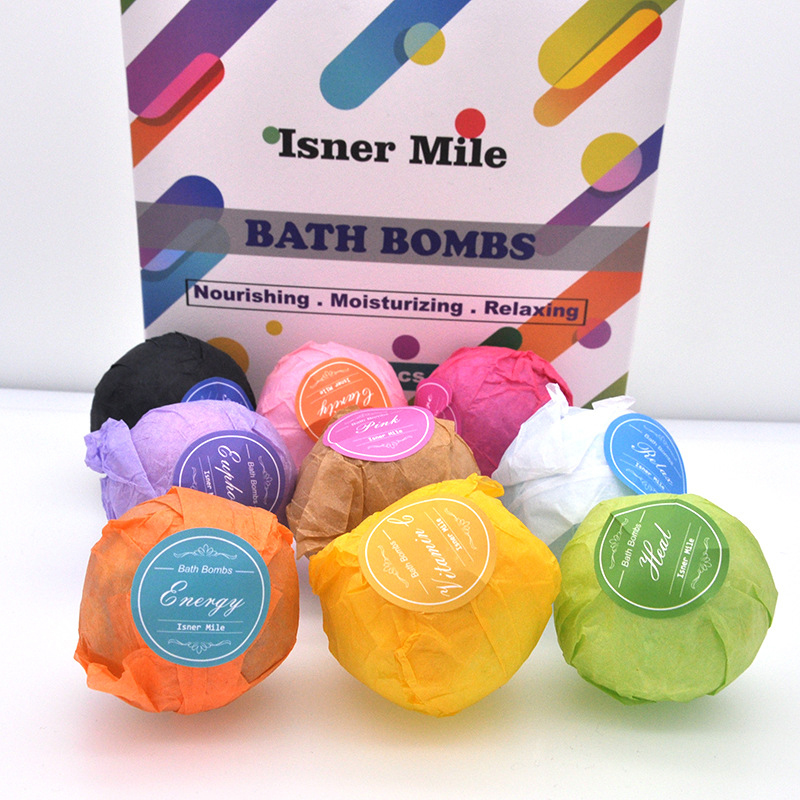 Bath products and not trial sizes. They are of high quality aromatic scents not something found at a general store or any of our competitors. 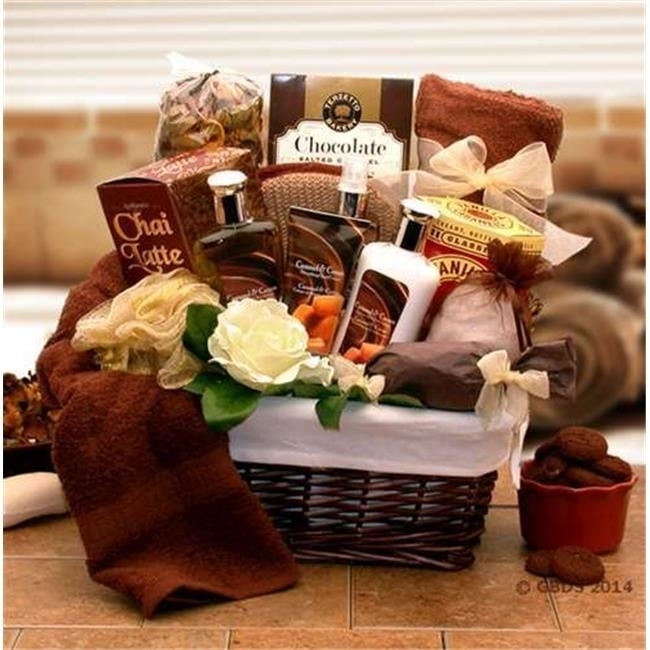 The scent is a combination of caramel and cream which is a rich earthy scent. Features. Fabric lined dark stain willow hamper. 8 oz. Caramel &cream moisturizing body lotion. 6 oz. Caramel &cream moisturizing hand cream. 8 oz. Caramel &cream moisturizing bath gel. 8 oz. Caramel &cream refreshing body spray. Aromatherapy potpourri. 36x48 bath towel. Old fashioned vanilla caramels. Chocolate and caramel cookies. Chain latte tea. Bath loofah. Almond &oatmeal bath soap. Soothing bath salts in a satin sachet. Exfoliating bath pad. Adorned with flowers and topped with a gold handmade bow. Dimension - 13 l x 9 w x 15 h in.